Spring is the perfect time of year to transform a dull concrete patio or walkway into a real showstopper. Learn how to give your boring gray concrete slab a facelift with a decorative concrete finish that can change the look of your yard. Prep is the key to success for any concrete project. First things first, completely clear the space, then sweep the concrete surface clean, and power wash if necessary. Next, scrub away removable stains with a heavy-duty concrete cleaner like W.R. Meadows Ultrite Degreaser & Stripper. This biodegradable concrete degreaser penetrates concrete to soften, lift and remove oils, grease and dirt, plus existing curing compounds and seals. We typically don’t recommend priming concrete for staining; just make sure the surface is thoroughly clean before application. Now it’s time to apply your decorative finish. One thing to keep in mind is that here in the dry Utah climate, paints don’t adhere very well to concrete surfaces. Instead of painting, we recommend a quality concrete stain that infuses color deep into the concrete, instead of covering the concrete on the surface. Different stains are appropriate for different projects and yield different looks. NewLook Original Solid Color Stain, Smart Color, and Faux Fusion, and Innotech Concrete Acid Stain and Color Easy each create different types of finishes that works well in our climate. Since each stain varies in result and application, ask an Intermountain Concrete Specialties expert to help you find the best option for your project and desired look. 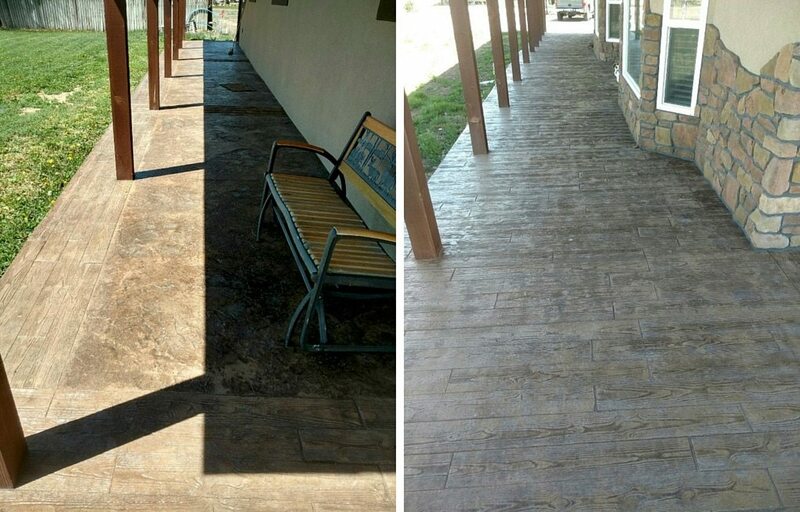 Tracy in our Ogden Intermountain Concrete Specialties showroom recently completed this backyard patio DIY at his home. There are a few ways to create this look. into newly placed concrete using Innotech Integral Dye to color the concrete, and then use Innotech Powder Release to highlight the grain of the wood texture stamp. If your concrete is already poured you can use Innotech Stampable Overlay over the existing concrete to give you texture and color. You can also refresh your concrete with a new color by using the NewLook concrete stains mentioned above. Most importantly, make sure to protect your investment by applying a high-quality sealer once staining is complete. ICS High Gloss is a great outdoor sealer for decorative concrete. Formulated to seal, protect, and enhance colored and stamped outdoor concrete surfaces, ICS High Gloss Sealer creates a durable, breathable, non-yellowing, high-sheen finish. Best of all, this acrylic-based liquid sealing compound is easy to apply and dries quickly—so you can get outside and enjoy your newly transformed concrete patio!